A sacrament, according to the Catechism of the Catholic Church is a visible sign of grace, instituted by Christ and entrusted to His Church, by which divine life is dispensed to us. The purpose of the sacraments is to sanctify our lives, to build up the Body of Christ (its members), and to give worship to God. The Catholic Church recognizes seven sacraments. These sacraments we know and celebrate publicly as: Baptism, Confirmation; Holy Eucharist; Reconciliation, Anointing of the Sick, Holy Orders and Matrimony. Baptism is the first sacrament and the foundation for all the other sacraments. In the first letter of St. Peter he tells us that we are saved by Baptism (1 Peter 3:21.) Through this sacrament we become children of God and heirs of Heaven. Parents should have their newborn baptized as soon as possible after birth. 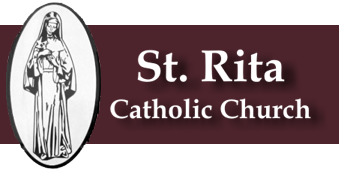 To have your child baptized please contact the parish office at 717.642.8815. Arrangements will be made for a formation session and to set a date for your child’s Baptism. Read more from the USCCB on the Sacrament of Baptism. Confirmation is one of the sacraments of initiation, along with Baptism and Holy Eucharist. Generally this sacrament is administered to teens in the eighth grade following a two year program of preparation through our Religious Education Program. Adults who have not been confirmed in the Catholic Church are invited to learn more about receiving Confirmation through the RCIA program. Read more from the USCCB on the Sacrament of Confirmation. Holy Eucharist is the sacrament in which the Body and Blood of our Lord Jesus Christ is received under the appearance of bread and wine (John 6). The Real Presence is in answer to Christ’s promise to remain with us until the end of time. All practicing Catholics may receive Holy Communion (Eucharist) at any Mass on Sundays or weekdays. Children making First Holy Communion must be enrolled in our Religious Education Program for two years. We have Extraordinary Ministers of Holy Communion who visit hospitals, convalescent centers as well as parishioners’ homes, each week. If you are hospitalized or homebound due to prolonged illness or disability, please contact the parish office to arrange visitation and reception of the Blessed Sacrament. Adoration of the Blessed Sacrament is when the faithful celebrate and adore the Real Presence of Jesus in our Saint Gaetano Errico Adoration Chapel on Monday 9:00 am through Friday 9:00pm, located at the House of Studies at 350 Tract Road, Fairfield, PA. While Adorers have scheduled hours, all are welcome to come visit and spend time with Jesus. Read more from the USCCB on the Sacrament of Holy Eucharist. Reconciliation is the sacrament where, through God’s mercy, sins are forgiven. Christ, in His love for humanity gave His priests the faculty to forgive sins (John 21: 21-23). Reconciliation is offered every Tuesday at 10:00 am and Saturdays at 10:00 am and 3:00 – 4:00 pm or by appointment with the priest. All parishioners are encouraged to receive the sacrament regularly. Read more from the USCCB on the Sacrament of Reconciliation. Anointing of the Sick (James 5: 13-16) is the sacrament through which Christ’s compassion for the sick and the suffering is offered by the prayer of the priest. Anointing of the sick is administered to those who are seriously ill, anticipating surgery, or weakened because of prolonged illness or advanced age. Please inform our parish rectory about the sick within our parish so we may minister to them with this Sacrament and Holy Communion. Call the parish office at 717.642.8815. Read more from the USCCB on the Sacrament of Anointing of the Sick. Holy Orders is the sacrament by which, through the imposition of the bishop’s hands, (Acts 7: 1-7) a man is consecrated to the priesthood of Jesus Christ. To assist you in discerning in your faith life a calling to serve the Church as a priest (or religious Brother or Sister,) please contact our parish priest to further explore the call of God in your life. You may also visit the vocations portion of the Harrisburg diocese website, or that of the Missionaries of the Sacred Hearts of Jesus and Mary. Read more from the USCCB on the Sacrament of Holy Orders. Matrimony is the sacrament whereby a man and a woman are united in an unbreakable bond of love. In Mark’s gospel (10: 1-12) Jesus emphasizes the sacredness of matrimony and its image of God and His Church. Before a couple makes any plans or sets a date they must first contact the parish priest and make an appointment to discuss the requirements set in place by the Diocese of Harrisburg. Please call the parish office at 717.642.8815 to make an appointment with the priest at least nine months in advance. All couples are required to fulfill all of the requirements set down by the Diocese of Harrisburg. Read more from the USCCB on the Sacrament of Matrimony.